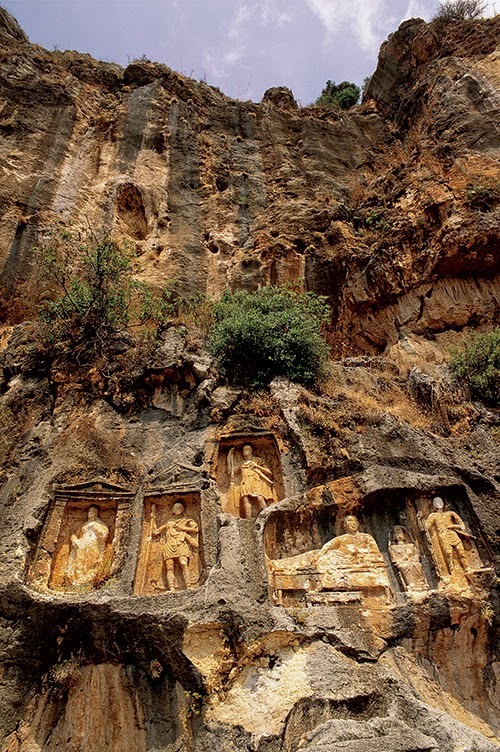 Adamkayalar (literally "man-rocks") is a site in Mersin Province, Turkey, famous for its rock carved figures. This site lies on the southern slope of the Taurus Mountains, and is several kilometres north of the Mediterranean coast. 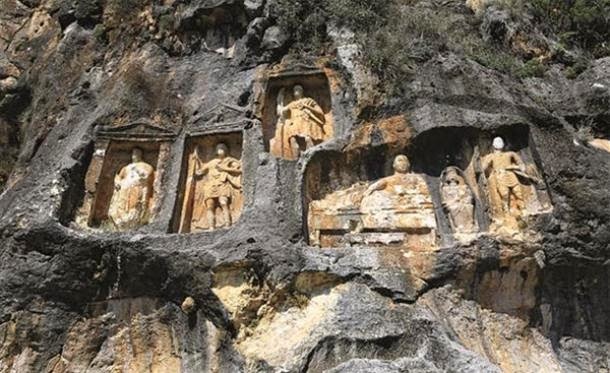 There are 17 human figures carved into 9 niches. Of these figures, there are 11 males, 4 females, and 2 children. 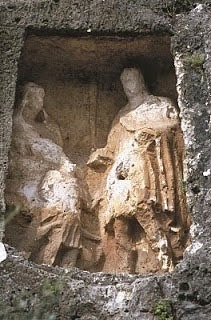 The date of these figures is unknown, although it has been speculated that they were carved between the 4th century B.C. and the 2nd century A.D. Due to the stylistic changes that can be detected in these figures, it has been suggested that they were carved overtime. As there are no written records about these carvings, much is unknown about them. It is claimed that Adamkayalar was a site for a mortuary cult. This may be supported by the figure lying on a bed, which represents the deceased (this is a common motif in the Roman world to depict a dead person). In addition, it is claimed that there are inscriptions on some of the figures that provide some information about the people who built the tombs, and the people buried there. Yet, the poor preservation of these inscriptions means that only fragmentary information about the figures can be gained from them. Since no literary evidence is available, and there is little epigraphic evidence as well, we might turn to archaeology to aid our understanding of these enigmatic carvings. First of all, one could consider the position of these monuments in the landscape. In ancient times, the valley road that passed through Adamkayalar would have been important in connecting the Mediterranean coast with the hinterland. Therefore, people who passed through Adamkayalar would have seen and been ‘seen’ by these figures. Whoever carved these figures would almost certainly have been powerful individuals in life, and attempted to immortalise their authority by stamping it into the landscape. Many of these figures depict armed warriors. Perhaps there was an elite class of warriors who controlled this region. Perhaps, that was an idealistic portrayal of the men in power. It is not surprising that the ruling class in this area had to/wanted to be portrayed as tough military men. After all, Cilicia was home to the notorious Cilician pirates. These were the pirates who once kidnapped Julius Caesar, and held him for ransom. They met a sticky end though, when Caesar avenged himself after the ransom was paid. Nevertheless, Adamkayalar was not merely a monument for the display of military might. One scene is said to show a soldier leaving his daughter and wife. In addition, there is a little dog as well, which is supposed to symbolise loyalty and represent the unity of this family unit. Hence, there is an element of intimacy in these carvings, perhaps a statement that family bonds cannot be broken, even by death. 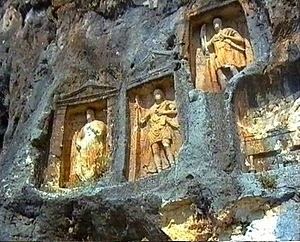 Perhaps it is this depiction of the family that sets Adamkayalar apart from most other rock carved figures of the Near Eastern region. There are many well-known rock carvings in the Near East, such as that of the Darius I at Behistun and that of the Sassanian kings at Naqsh-i-Rustam. Yet, all these carvings were commissioned by kings for the display of imperial might. While the carvings of Adamkalayar may, to some extent, be a statement of military power, it also shows a softer side, in which the family is represented. It is perhaps this familial scene that connects us to the people depicted in the carvings. It is a shared human emotion, one of sorrow in the face of death, and the belief that our loved ones, though gone, will never be forgotten.